Garage Door Parts Can Be Perilous - Heres What Consumers Should Know | Doors by Nalley, Inc. Author : Doors by Nalley, Inc.
You could describe your garage door as a moveable wall, and when it’s combined with an automatic opener, it’s the biggest and probably the most dangerous moving object in your home. In fact, according to the US Consumer Product Safety Commission, more than 30,000 Americans are injured by malfunctioning garage door parts every year. What’s more alarming is that this number counts only for injuries that required medical treatment. The vast majority are not reported. Professional installation, maintenance and inspection of garage door parts are essential to ensure trouble-free, safe operation. An incorrectly adjusted automatic opener or door can exert a lethal force when the garage door closes. This could result in serious injury, or even death, from being trapped under the door or hit by a closing door. Never walk or stand under a moving door and don’t play ‘beat the door’. It’s not funny – it’s seriously dangerous. In case anyone is pinned by the door, teach everyone in your household how to use the emergency release. Garage door parts are not toys. Don’t let children fiddle with remote controls. Keep them out reach. When using the transmitter or push button, watch the door until it comes to a complete standstill. Teach your children about garage door safety. Explain the danger of getting trapped under the door. Tell children never to play near, or under, an open garage door and to keep their fingers and hands clear of hinges, joints, springs and other garage door parts. For garage door parts in Charlotte NC, contact us at Doors by Nalley, Inc. A family-owned business for over 20 years, we are proud of the high-quality craftsmanship and excellent customer service we provide. Give us a call anytime! Doors by Nalley, Inc. is Denver, North Carolina’s number one choice for garage door installation, maintenance, repair and replacement. Contact Doors by Nalley, Inc. 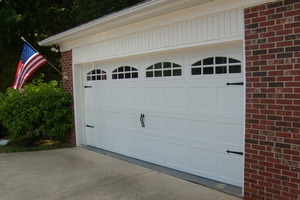 When It Comes to Commercial Garage Door Installation, Look No Further than C.H.I.